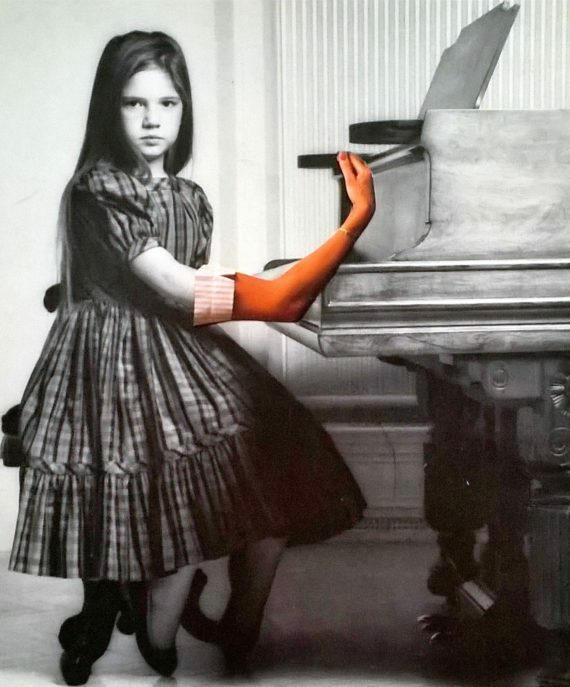 Jean McEwan is this month's featured artist member on a-n's Instagram. Richard Taylor talks to the Bradford-based artist about collaboration, the richness of sustained community work, walking, and much more. Jean McEwan is an artist and organiser based in Bradford who works across visual, curatorial, collaborative and socially-engaged practices. 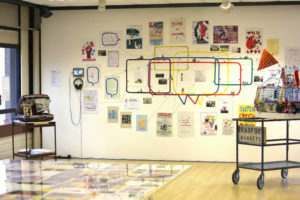 As well as making zines and photocollages, as evidenced in her a-n blog, McEwan has a widely developed participatory practice – informed by her previous career as a community worker – in which she creates spaces for meaningful connections between people. She is founder of Wur Bradford (Wur means ‘our’ or ‘we are’), a responsive grassroots arts project exploring connections between imagination, community and social change with people in the city. This month McEwan is the featured artist member on the a-n Instagram. What draws you towards collaborating with artists and non-artists? I love the third magical thing that comes out of two people sharing ideas, processes or making; I like the energy, the exchange. It’s about learning. As late US writer David Foster Wallace said: “Jump over the wall of self and inhabit someone else.” I enjoy working with people from different disciplines, who offer me new perspectives of understanding and experiencing the world. My closest collaborators at the moment come from a range of practices – theatre design, dance and coaching/facilitation. Your community-related projects see you working with groups of people over prolonged periods of time. What are the benefits of working like this, in terms of your practice and the integrity of the work you make? It takes a long time to make work with people that is truly meaningful – it’s about relationships, trust, and often just turning up. Suzanne Lacy says of her process that she goes somewhere and hangs out. I really relate to this. In many ways, just being there is the foundation. If you are responsive, and do art genuinely democratically with people, meaningful work will happen when ideas and conversations have space to breathe and grow. I’ve been lucky in recent years to have funding, enabling me to work over an extended period of time in places and with people. Community seed funding for Wur Bradford gave me three years to develop the project and the space – a market stall in the city’s Kirkgate Market – from its beginnings (just me with some posters and deckchairs chatting to people) to a larger collective run by three artists, which is commissioned to do all kinds of projects with a wide range creative, community and academic partners around Bradford. I did a two-year community residency with a group of disabled people in Blackburn through Super Slow Way. This also gave space for me and the group to explore and shape what we wanted to do, together. You’ve recently completed a number of Wur Bradford events, working with market traders in Bradford’s Oastler Market. Can you tell us more about this? My work in markets goes back to 2014 when I did a short residency at Oastler Market, and since then I have been fascinated by it. The people who work and shop there, the diversity of the communities that use it, the stories behind these and the sights, smells and sounds. Over the last couple of years Wur Bradford have been commissioned by Bradford Markets to work in Oastler. My artist colleague Chemaine Cooke and I found the market traders were really responsive. Now is an uncertain time for the market; it has been earmarked for demolition and relocation to a new site. We wanted to capture, document and celebrate Oastler at this moment in time – to ask the question with the traders, ‘What can art do here?’. 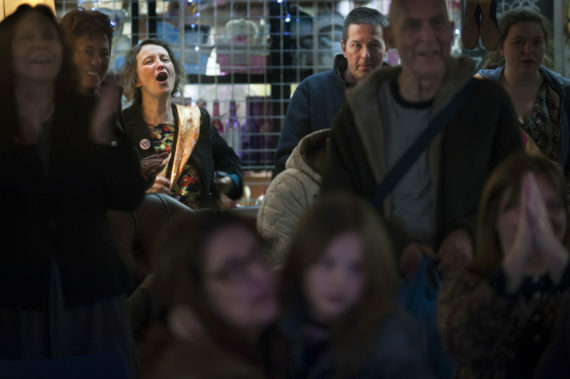 We devised the Arts Council England-funded project We Are Here and since January 2018 have been working with traders, members of the public and BCB Community Radio to explore and tell stories of Oastler and its people, through guided walks and two celebratory events that presented poetry, live music, print and a radio broadcast. We also presented the project as an exhibition with arts organisation Kala Sangam. Many of the participatory artworks you develop involve guided walks. What is it about walking you find interesting? As a kid I’d wander around the town where I lived, following random strangers around. I love the possibilities of walking as an everyday adventure. I have a dog, walking is an everyday activity that brings me great personal riches. I’m changed and in a different space after each walk, I’ve had a new thought or insight and feel more connected with the world. It comes back to play and adventuring and the child-like sense of exploration. I’m also very interested in pyschogeography and in the politics of space, and in the ways we can disrupt, resist, and make mischief with walking. What’s it like being based in the Bradford area? As a place with many cultures, histories and communities, Bradford is an endlessly fascinating city to work in as an artist. I respond to its DIY, grassroots and radical traditions. My connections are as much with community and activist networks as with the arts, and this helps feed my knowledge and understanding of the city. There is a very can do attitude here that isn’t common in other places; in my experience if you want to do something in Bradford there will be someone who is willing to help. I love this openness and generosity. People support each other because they want good things to happen. 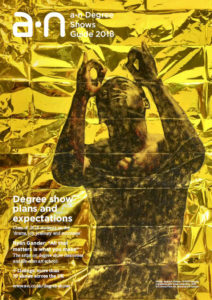 You’ll find that across the board; from individual artists to brilliant arts organisations like Brick Box, NPOS, Impressions Gallery and Arts on Campus at University of Bradford. I am working on a long-term project with creative coach and facilitator Bev Morton on My Next Chapter For Creatives, a programme for artists to look at the past, present and future of their practice. We are developing the project to roll out nationally and internationally. 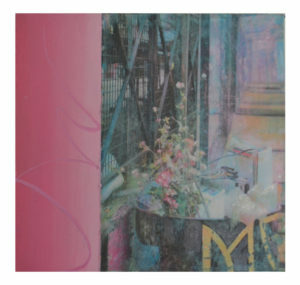 We are delivering a programme at South Square Gallery later this May, with others to follow. 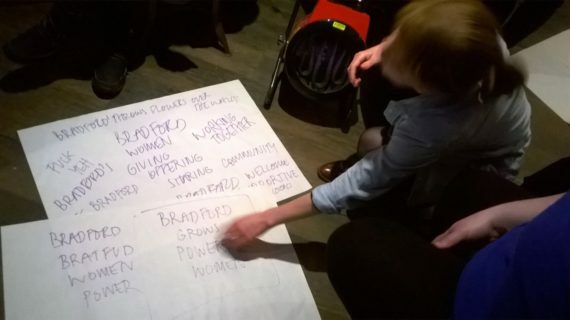 With Brick Box and group a of Bradford women I’m working to produce a banner with the message ‘Bradford Grows Powerful Women’ for Artichoke’s mass participation event Processions, in London on 10 June 2018, to mark the 100-year anniversary of suffrage for some women. The group has come together especially for the project from all backgrounds and walks of life. They are all inspirational and have bonded so well. With two other Bradford zinemakers Mike Barrett and Munaza Kulsoom, I’m co-organising a Bradford Zine Fair in June 2018 at Bradford City Library. And I’m also delivering zine making sessions within the upcoming seminar series ‘Welfare Imaginaries‘, organised by a group of academics in Lancaster, Liverpool and Birmingham, looking at the past, present and future of the representation of welfare.